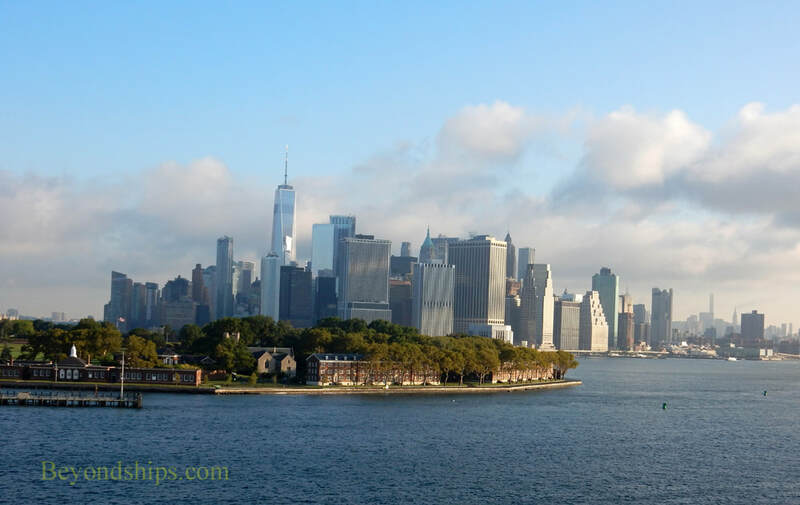 Downtown Manhattan is where the city began. Indeed, Wall Street got its name because that was where the wall was that separated the original settlement from the wilderness. Today, the area is the financial, legal and governmental center of the city. numbered grid system for its streets, the streets downtown tend to meander and they bear names rather than numbers. Although it can be confusing, this relatively small area is quite walkable. Indeed, it is the only practical way to explore the area. trade securities and from that the area grew to become the center of capitalism. 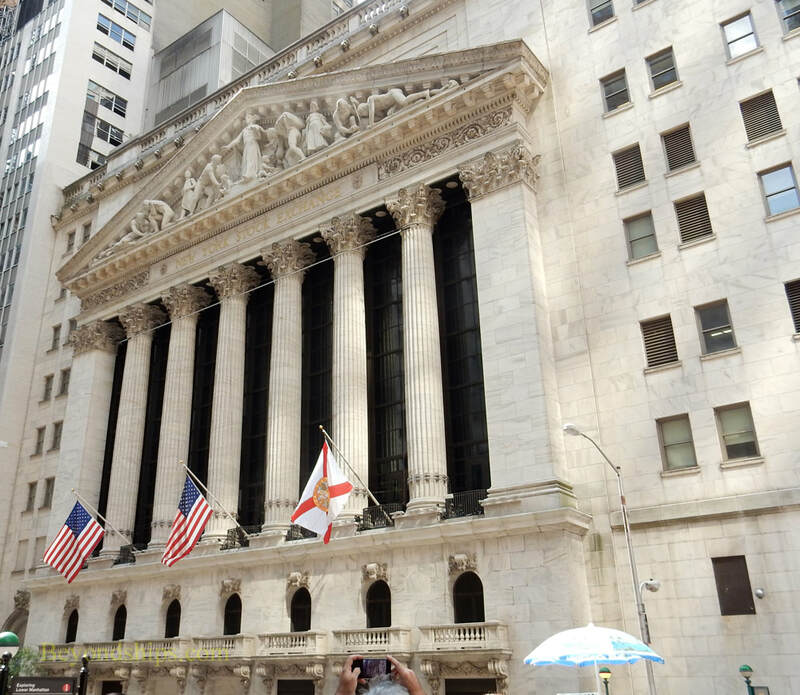 On this page we'll look at some of the attractions along Wall Street. 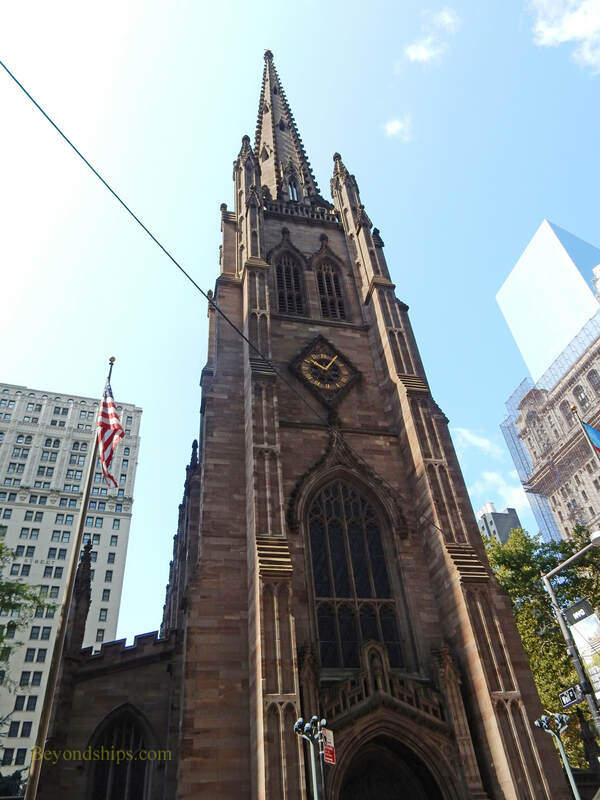 At the western end of Wall Street is Trinity Church. Tracing its history back to 1697, Trinity remains a vibrant Episcopal parish acting not only as a place of worship but as a school, a player in commercial real estate and a grant-making organization. Alexander Hamilton, who was one of the foremost architects of the U.S. Constitution as well as of the U.S. financial system is buried in the church grounds. The current church dates from 1846. Wall Street but a few steps down the adjoining Broad Street. Designed by George B. Post, the building was erected in 1903. The sculptures on its impressive pediment are by John Quincy Adams Ward. 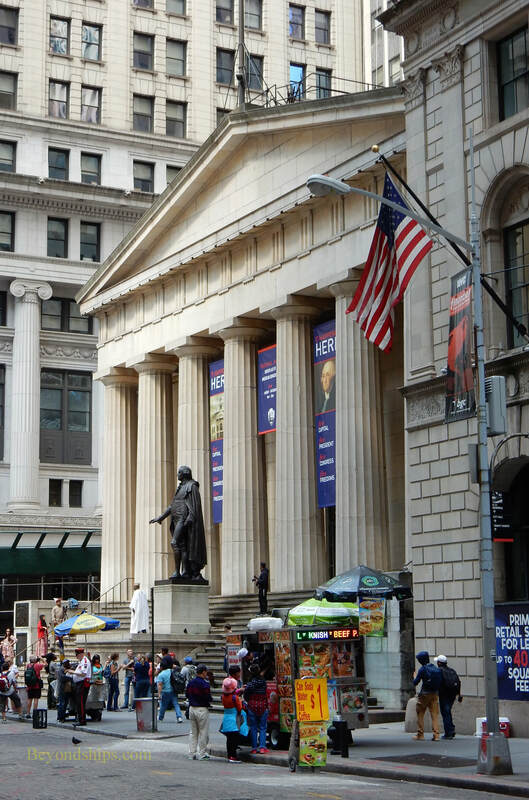 Back on Wall Street itself is Federal Hall (left) at the corner of Wall and Broad. On this site, George Washington was inaugurated the first President of the United States, the first session of the United States Congress was held and the Bill of Rights of the U.S. Constitution was written. The current structure was built in 1842 as a customs house and was later used as a sub-treasury building. Today, it is operated as a museum by the National Park Service. Going east, you come to the East River. Just north is South Street Seaport. This area contains historic ships, a museum with maritime-related exhibits, restaurants and shops housed in the historic waterfront buildings and piers. 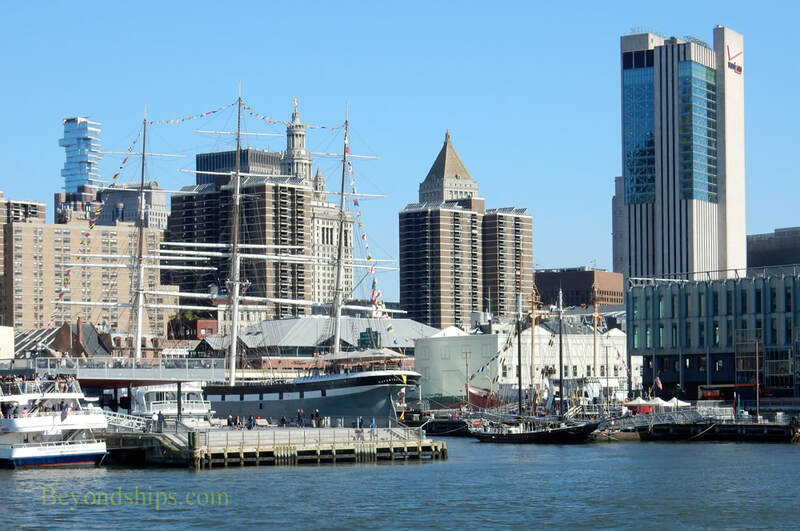 The Seaport Museum sits in the shadow of the Brooklyn Bridge (left). Completed in 1883, it was then longest suspension bridge in the world. Indeed, at 1,600 feet, it was 50 percent longer than any previous suspension bridge. It was designed by John A. Roebling and completed by his son Washington and daughter-in-law Emily. 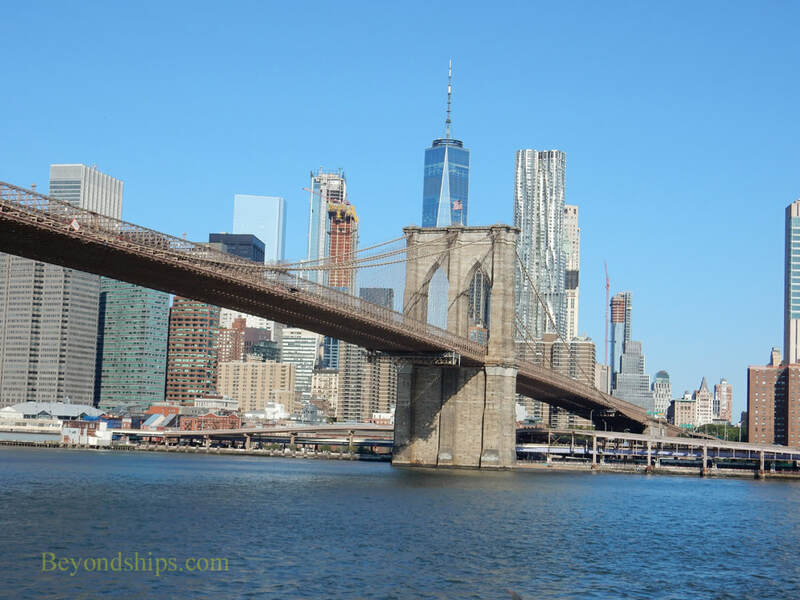 The bridge has a pedestrian walkway and it is popular to walk across to Brooklyn on fine days.